In recent years Britain, the world's sixth largest economy, has experienced unimagined and accelerated change—from its vast population growth due to EU migration, deeply affecting the cultural fabric of many of its cities and towns, to the subsequent public referendum to leave the EU altogether - the lasting effects of which are still to become clear. There is constant speculation in the media about the shape of the future—what will Britain's new relationship with Europe look like, what will be the lasting impact of what is now a multicultural society, and what of Britain's future place on the world stage? However, what can be said with certainty is that Britain, as ever, will “manage” the change. It will “make do,” “muddle through,” somehow accommodate and absorb what it has to in order to secure the future and keep its traditions and core values intact. Culture Smart! Britain aims to help you gain much more from your stay in these islands through a greater understanding of the quirks, customs, attitudes and changing ways of British life. 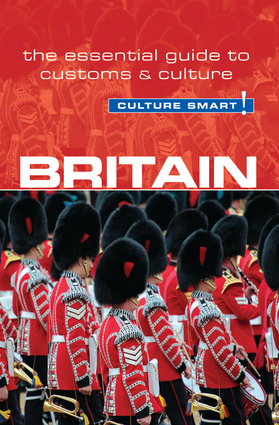 With concise sections on the British at home, at play and at work the guide will help travellers and business people alike avoid common cultural pitfalls and approach experiences with greater understanding, sensitivity and confidence. During conversation a healthy amount of personal space is expected to be maintained, and "space invaders" are generally not appreciated, though rush hour on the London Underground and the pub might be the exceptions!